My last robot project was the SR04. 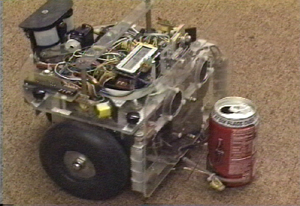 This robot won first place in the Dallas Personal Robotics Group RoboFest Contest 1998, 1999, and placed in 2001, 2002 in the QuickTrip and TTime categories, and third in 1999 in Line-Following, and appears to be the only robot ever to have successfully completed the CanCan soda can recognition and collection task, which it has done five times. 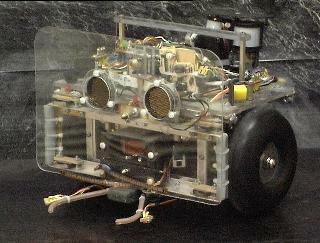 It won second place at the Seattle Robotics Society Floor Exercises competition at Robothon 2001. I have a detailed HTML article describing the robot platform, sensors, and software, with some pictures and CAD drawings of the various mechanical and electronic sub-systems. The same article can be downloaded in Adobe Acrobat PDF format. I've also recently put together some HTML documentation on the SR04 can and tennis ball gripper with some photographs and exploded assembly drawings. This gripper was added to the robot in order to compete in the DPRG can collecting contest. Here is an mpeg video (5 Mb) of the robot running the QuickTrip course. I added an extra obstacle (cardboard box) in a flagrant to attempt to impress the judges. Here is a smaller version (1.7M) that seems to run way too fast. Here is another mpeg video(714K) of the SR04 can gripper. 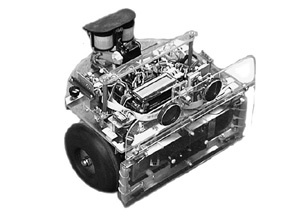 Stereo sonar are used to steer the robot toward the can until it touches the pair of bend-sensor feelers on the front bumper. The feelers trigger the gripping response. 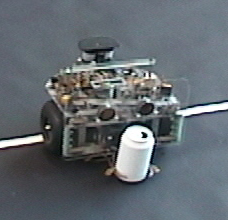 Once the gripper has closed on an object, the robot re-orients itself towards its goal and attempts to return the can to the point of origin. The white flash of light beneath the gripper arms just as it grabs the can is accompanied by an electronic beep (not heard on this silent mpeg) that is part of the technique by which the robot counts the cans it has collected. Here is an MPEG video (2.8 Mb) of the robot finding and retrieving two of the six randomly placed soda-cans during the TTime competition. You can see the stereo sonar "waggling" the robot back and forth as it acquires the coke can targets. Here is the complete MPEG video (15 Mb) of the 2002b CanCan contest. The robot locates and retrieves all six randomly placed soda cans. Kipton Moravec MC's the competititon. After locating and fetching each can, the robot returns the cans to the starting place. It then squares itself to the contest walls and measures their distance, using it's stereo sonar. With the exact location and angle measured and stored, the robot does a 180 degree scan, looking for sonar reflections which are not from the walls (which it now knows accurately). Any can detection just stops the scan, and the robot is left pointing at a can. If no cans are found it marks this sector as empty and proceeds to the next. The cans are painted white in this contest, to simplify the process of locating them using video. This doesn't matter for the sonar technique used by SR04. Obstacle avoidance in the attic (6.7M) of SMU's Heroy building. The robot is trying to go 24 feet straignt forward, turn around, and come 24 feet straight back, but the floor is strewn with junk we found in the attic: old equipment, trash and cables on the floor, and a couple of chairs thrown in for good measure. On the return trip it tries to go around the building rather than take the shortest path. Fortunately it collides with some trash on the floor and gets re-oriented. Navigating 4 waypoints (6.2 M mpeg). Navigating 4 waypoints with a wall in the way and a moving obstacle (33 M mpeg). Navigating 4 waypoints with multiple obstacles (7.0 M mpeg). The is a counter-clockwise version of the same four waypoints as the previous videos: (0,0), (0,120), (-120,120), (-120,0), (0,0). The robots encounters fixed obstacles (cardboard boxes) on the second leg of the journey, and another dynamic obstacle on the fourth leg of the return trip. Note that the placement of the cardboard boxes prevents the robot from arriving precisely at the first waypoint. A full-resolution version (32M mpeg) is also available. Navigating 4 waypoints with a bunch of stuff in the way (7.8 M mpeg). For this run the robot is rotated 90 degrees from the other routes, and is again seeking four waypoints arranged as a clock-wise, 10 foot square. There is an architectual divider between the first and second coordinates, a recycling bin between the second and third, and a trashcan between the third and fourth. A full-resolution version (32M mpeg) is also available. Staying on the sidewalk (7.4 Mb mpeg) using sonar and IR detectors. Here SR04 is attempting to follow a sidewalk by sensing the discontinuity between the concrete and the grass on either side. A full-resolution version (31M mpeg) is also available. I've written some e-mail in response to questions about the robot concerning things that I haven't fully documented. These include a PID speed controller, shaft-encoder Odometry and dead-reckoning, and stereo Sonar. There is a more comprehensive article on odometry and navigation that focuses more on the jBot robot, but includes SR04 software examples. I also have a new article on the Subsumption Programming for SR04 and jBot.